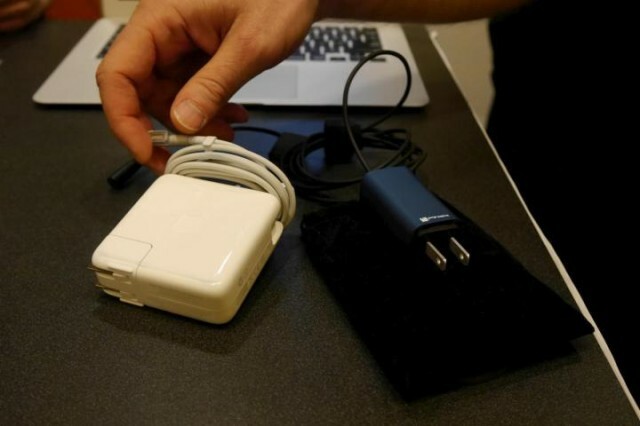 That may have changed with the appearance of the Finsix laptop charger, which used a high frequency switching technology developed at MIT to impressively shrink the size of a standard laptop charger to something that could charge your iPhone. A full-powered AC adapter that is 4x smaller and 6x times lighter than what is typically found on the market today, the reduced form factor also means that the wall charger won’t leave you searching for three-prong outlets. In the process it eliminates the bulky “inline brick” and thick AC-side cord commonly found on many laptop chargers. The auxiliary USB port can additionally be used for powering other devices, meaning that the adapter can replace your smartphone and tablet chargers also. There’s just one problem: while the above picture compares the size of a Finsix to a MacBook power brick, Apple doesn’t license out use of its MagSafe magnetically-attached power connector for third-party universal power adapters. Could this a tech acquisition worth making for Apple? It sure sounds like one. The Finsix goes into production this summer, with a target price of $89.